Three respected advanced metric systems believe Monday's Alabama vs. Clemson national championship game will be closer than the current point spread in Las Vegas expects. Three respected advanced metric systems believe Monday's Alabama vs. Clemson national championship game will be closer than the current point spread in Las Vegas projects. [ESPN's FPI (0.3 points)](http://www.espn.com/college-football/team/fpi/_/id/333/alabama-crimson-tide), [Massey-Peabody Analytics (1.3)](https://twitter.com/MasseyPeabody/status/1080900939840663553) and the [S&P+ Ratings (1.0)](https://www.sbnation.com/college-football/2018/12/2/18122019/ncaa-football-rankings-2018-college-football-playoff) each project Alabama to win by less than 1.5 points and with the current point spread being Alabama -5.5, the power rating projections are music to underdog bettors' ears. Furthermore, ESPN's FPI gives the Tide a 51.4 percent chance to win the game outright, which equates to a moneyline bet of -106. Nick Saban's team is listed at -220 at the Westgate LV SuperBook. S&P+ also give Alabama about a 52 percent win probability (-108 odds). So what do the metrics have against Alabama? They are the No. 1 ranked team in both systems with the No. 2 offense and No. 12 defense, per S&P+. A dive inside the numbers shows the Tide have allowed big plays at a rate inconsistent with its No. 12 rating and struggle inside the red zone on defense -- ranking 114th in first-and-goal success rate. __MORE:__ [College Football Playoff semifinals betting recap](https://www.betchicago.com/college-football-playoff-betting-recap-clemson-alabama) While Alabama's defense ranks out as one of the best, it has struggled with explosiveness at times and ranked 46th and 35th in defending rush and pass explosiveness, respectively, entering the Orange Bowl. Oklahoma's No. 1 S&P+ offense proceeded to total 471 yards, 308 of which came from Kyler Murray through the air. It's the second straight game Alabama has allowed over 300 yards passing. In the SEC title game, Georgia also rushed for 153 yards on 3.9 yards per carry. Prop bettors can expect a heavy dose of Clemson RB Travis Etienne and his 8.3 yards per carry to play a key role in Monday's game. Etienne's threat should open up the passing game for Trevor Lawrence if he can avoid the Tide's NCAA-leading sack rate. Like in the 2017 championship won by Clemson, vertical plays could be the difference and Alabama QB Tua Tagovailoa has shown his ability to throw the ball deep as evidenced by his 11.4 yards per passing attempt. Clemson might not be as vulnerable to big plays through the air as the Tide secondary but the Tigers haven't faced a top-15 S&P+ offense all season. We know all about Clemson's stout defensive line but the secondary will make or break the Tigers' chances of pulling the outright upset. The critics will highlight Clemson’s poor pass defense against Texas A&M and South Carolina when the Aggies’ Kellen Mond and the Gamecocks’ Jake Bentley combined to pass for 940 yards and eight touchdowns. Notre Dame QB Ian Book threw for just 160 and no TDs in the Cotton Bowl but never tested the Tigers' secondary like Tagovailoa will right out the gate. # 2019 College Football Playoff championship game ## Alabama vs. Clemson national championship betting lines, odds and prediction 7 p.m. CT on ESPN from Levi's Stadium in Santa Clara, Calif. __Point spread:__ Alabama -5.5 __Total:__ 57.5 __Betting line movement and games notes:__ The point spread has settled on 5.5 at the Westgate as of Monday's update after early action on Dec. 23 took the line from 6.5 up to 7 and back down as low as 5.5. William Hill opened Alabama -5.5 on Dec. 29 and also sits currently at 5.5. The total is dropping to 57.5 after reaching 59.5 last week. __Play and win:__ [Join our free contests](https://betchicago.chalkline.com/) ## Alabama football betting records, stats 2018 SU record: 14-0 2018 ATS record: 8-6 2018 O/U record: 8-5-1 S&P+ rank: 1 Off. S&P+ rank: 2 Def. S&P+ rank: 8 Special Teams S&P+ rank: 93 __Note:__ S&P+ rankings are an advanced data set of tempo- and opponent-adjusted components of the five factors of college football: Efficiency, explosiveness, field position and finishing drives. Per creator Bill Connelly, a fifth factor, turnovers, is informed marginally by sack rates. ### When Alabama has the ball Overall: Alabama No. 2 S&P+ offense vs. Clemson’s No. 1 defense (Clemson advantage) Rushing: Alabama No. 4 S&P+ offense vs. Clemson’s No. 1 defense (Clemson advantage) Passing: Alabama No. 1 S&P+ offense vs. Clemson’s No. 4 defense (Alabama advantage) Success rate: Alabama No. 1 S&P+ offense vs. Clemson’s No. 1 defense (tie) Explosiveness: Alabama No. 3 S&P+ offense vs. Clemson’s No. 8 defense (Alabama advantage) Run Explosiveness: Alabama No. 82 S&P+ offense vs. Clemson’s No. 1 defense (Clemson advantage) Pass Explosiveness: Alabama No. 5 S&P+ offense vs. Clemson’s No. 12 defense (Alabama advantage) ## Clemson football betting records, stats 2018 SU record: 14-0 2018 ATS record: 8-6 2018 O/U record: 6-8 S&P+ rank: 2 Off. S&P+ rank: 7 Def. S&P+ rank: 1 Special Teams S&P+ rank: 99 ### When Clemson has the ball Overall: Clemson No. 5 S&P+ offense vs. Alabama’s No. 12 defense (Clemson advantage) Rushing: Clemson No. 6 S&P+ offense vs. Alabama’s No. 3 defense (Alabama advantage) Passing: Clemson No. 17 S&P+ offense vs. Alabama’s No. 5 defense (Alabama advantage) Success rate: Clemson No. 6 S&P+ offense vs. Alabama’s No. 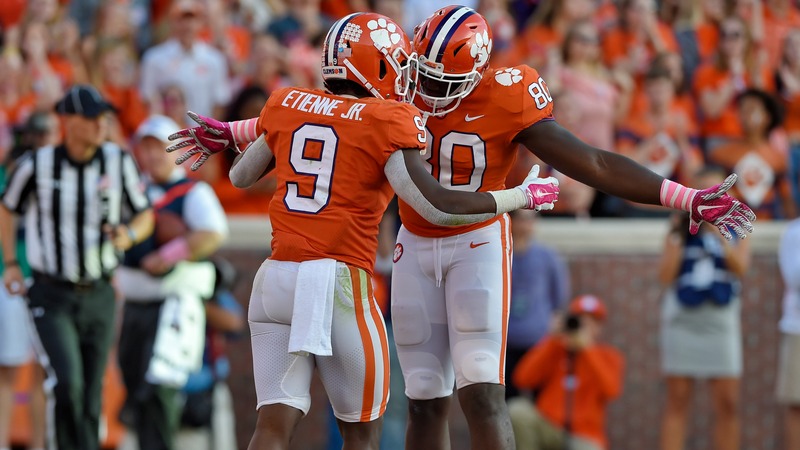 6 defense (tie) Explosiveness: Clemson No. 4 S&P+ offense vs. Alabama’s No. 50 defense (Clemson advantage) Run explosiveness: Clemson No. 18 S&P+ offense vs. Alabama’s No. 29 defense (Clemson advantage) Pass explosiveness: Clemson No. 50 S&P+ offense vs. Alabama’s No. 56 defense (Clemson advantage) ## Alabama vs. Clemson betting results, trends Alabama and Clemson are meeting for the fourth time in four bowl seasons. Here are the previous three results: 2015: Alabama 45, Clemson 40 (+6.5, 50) 2016: Clemson 35 (+6, 51), Alabama 31 2017: Alabama 24 (-3.5, 47), Clemson 6 This season the Tigers are 7-2 ATS in their last nine games following a straight up win. UNDER is 8-2 in Tigers' last 10 games following a ATS win. Crimson Tide are 7-2 ATS in their last nine vs. ACC.